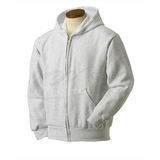 Hanes Kids Hoodies is a great lighter weight style, perfect for all seasons! These has a plenty of warmth without bulky weight, that's why kids go for this unisex hoodie. Plush, cotton-blend fleece pampers your youngster's skin. Hanes Kids Hoodies features a high-stitch density, so it lasts longer, without pilling and a cord-free hood helps block out wind and chill for kids safety. These hoodies has a roomy front pouch pockets keep hands warm and lunch money ready. Popular colors and a comfortable fit make this hoodie a favorite. Your little one will enjoy comfort and style with this Hanes Hoodie that features long sleeves and a relaxed fit. These Hanes Kids Hoodie is made from an eco-fabric blend of 70% cotton and 30% polyester and has full-length zipper closure.